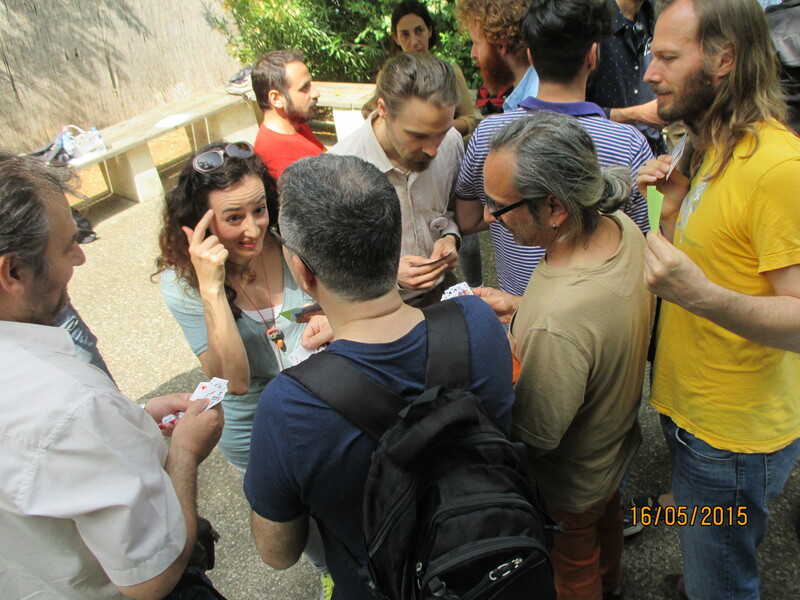 Dcalk is still active on the Ludobox R&D project ; 15th May was the beginning of our greek journey to the CommonsFest in Athens and other « detours ». CommonsFest in downtown Athens, Acropolis just above. 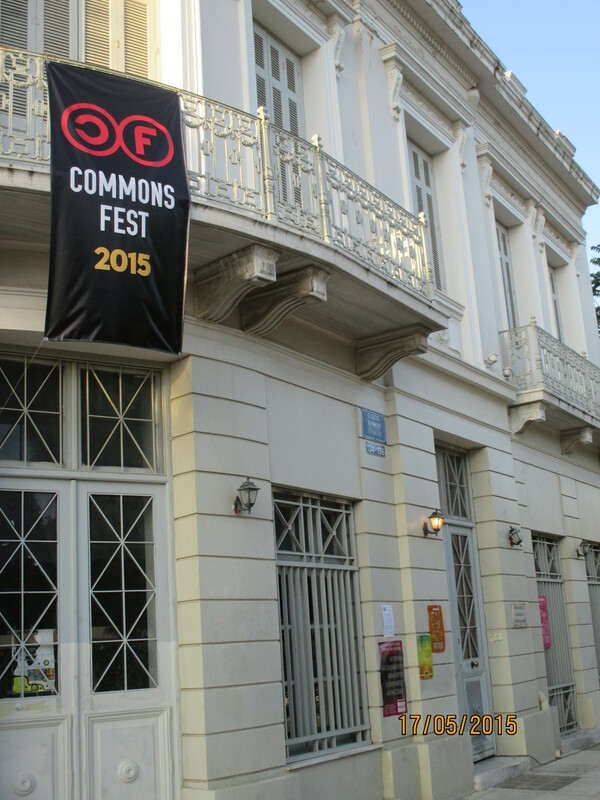 Cause Greece was and remains a great place to think/talk/make politics, public policy, radical activism… and our first step was the CommonsFest : a crossroad of energy for who trys to merge thoughts and tactics related to the commons. Even if half of the program was in greek language, we do have plenty of things to say about local and European initiatives we interacted with during this 3-days festival. And for sure, new game-related content. Trading floor game – open workshop. On Saturday morning, we followed the presentation of Trading Floor Game (la Corbeille). Conceived – by Sybille Saint Girons and Mathew Slater from « Valeureux » collective – as a pedagogical tool and released under Creative Commons licence, the game aims at experimenting how exchanges’ system affect individual and collective behaviours. 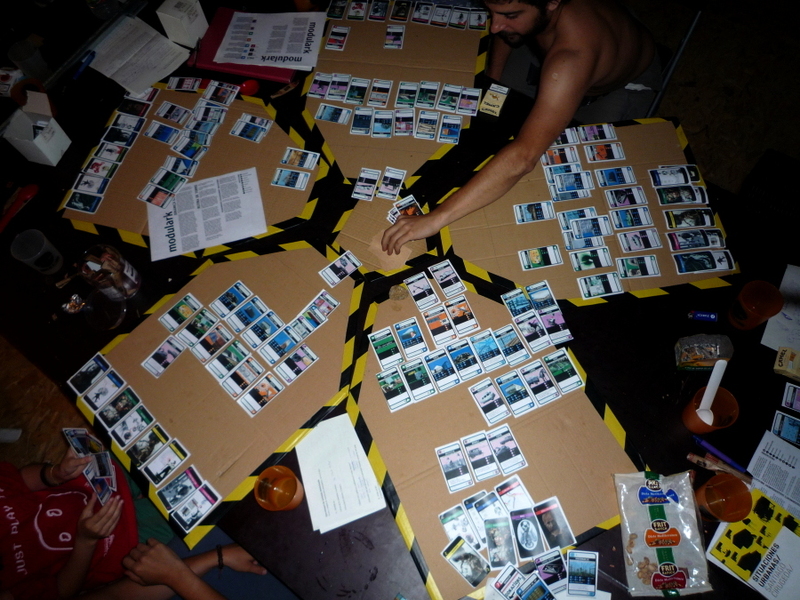 Successive sequences allow the players to try different approaches of economy (from swapping to centralized debt) with regular cards game and candy. The presentation was a bit messy (due to free participation instead of a workshop) and shortened to fit in the festival schedule, but we had a great moment of prospective economy. The festival was also a good occasion to keep tracking & talking with other « IdeaMakers » met last autumn in Marseille (see IdeaCamp). 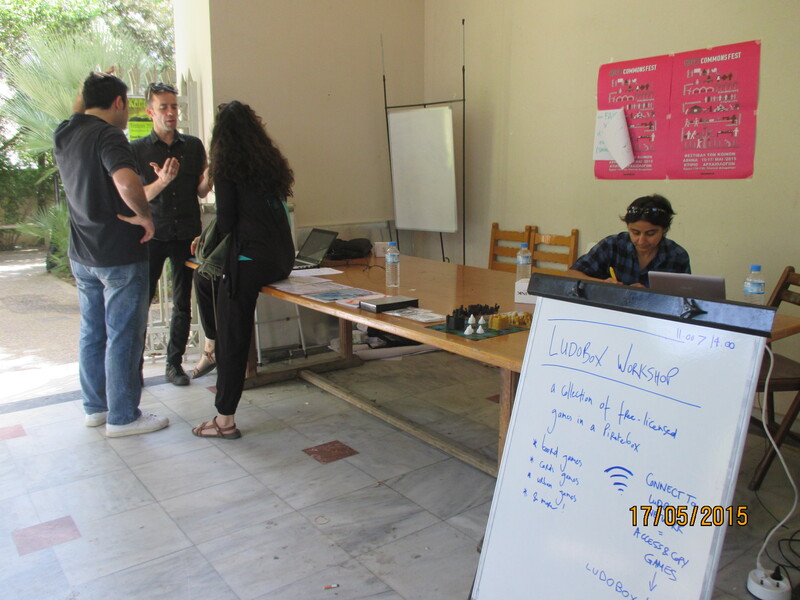 First of them, our greek host Vassilis Chryssos part of the CommonsFest organization and who is involved in the deployment of a wireless broadband community network in Sarantaporo, a remote village in Thessaly region, where the population decreases. « With ever fewer development opportunities, young people of our village are fleeing to urban areas. Lack of internet connectivity only makes this worse. » In the last 4 years, Sarantaporo project has been providing the locals with open internet connectivity. When infrastructures are thought and built up as commons, it offers, hopefully, responses to revive a region. Vassilis had the opportunity to join the Zemos98 festival, last april in Seville, focused this year on « Caring for the City – Reclaiming the Commons » and organized around a 3-days hackcamp. There, together with Carmen Lozano, another IdeaMaker, and other participants, they created a Commonspoly which was presented during CommonsFest. Obviously it is a remake of Monopoly revisited in a collaborative/cooperative approach. One more attempt to make something new out of this classic board game : Monopoly hacking are in some ways… common. Well, we didn’t manage to playtest it as the board and cards were edited in Greek but we are curious to follow the Commonspoly development (soon to be published: rules&regulations and cards.). In between hacking public space, mapping activism and a networking platform, we followed with attention Publicspace.tools, a project initiated by the Spanish collective Straddle3. Relying on their previous publication Legal Guide for the Activation of Public Space that » helps inform and arm people against the increasingly repressive laws and by-laws being passed by state and local governments in Spain », Publicspace.tools offers a multilingual app to archive and spread knowledge related to public space « activacion ». Having exchanged on the Ludobox project with David Juarez from Straddle3 before going to CommonsFest, he came to Athens with a gift for Dcalk : a printed version of Modulark. This educational cards game « allows players to experiment with forms of creation and self-management using architectural, energy and life-sustaining elements and other factors ». 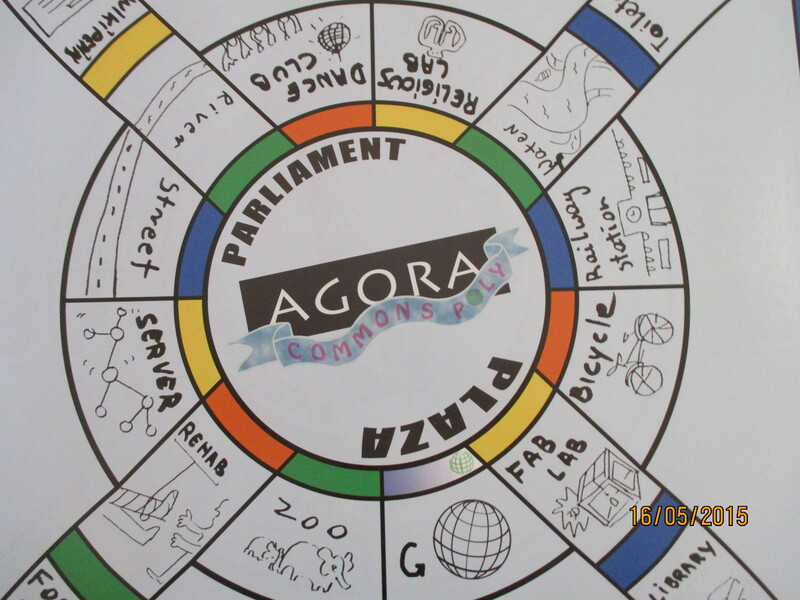 The game was designed to help grassroots organizations or activists groups to reach sustainability by experimenting a large scale of situations and exchanges. Our sample is in Catalan, but we very look forward the digital files… to be able to edit & translate them ! Made in Athens – squat scene. 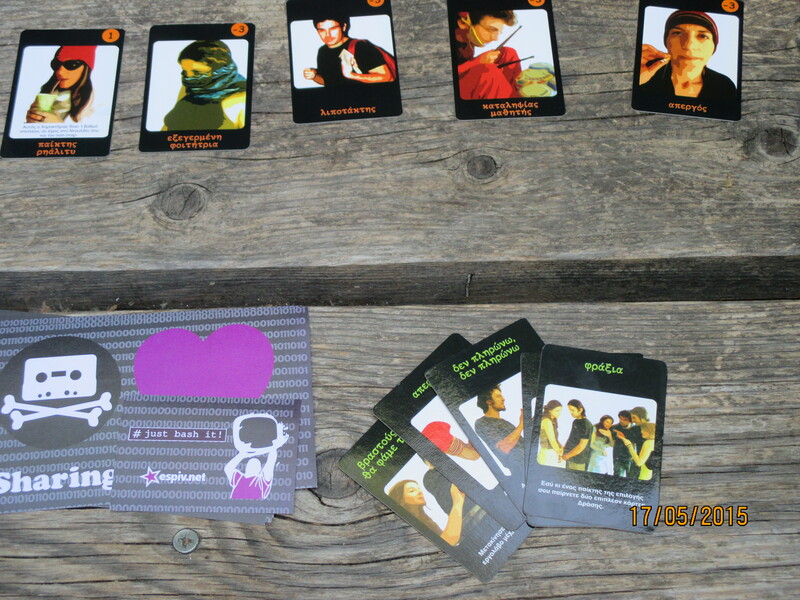 Thanks to Vassilli from espiv.net, we also had the chance to see a sample of a cards game, made few years ago by a squat team in Athens. Again, translation from Greek to English is a key issue to share the games in other circles through the Ludobox. Translation, translation … definitely one word to keep in mind for the Ludobox development, one that came quite often on the table when talking with Greek/Spanish/Catalan folks during the festival. We might consider a future « translation sprint », inspired by the collective experience of Carmen within Guerilla Translation or the development of a multilingual interface (Catalan/Spanish/English) for Piratebox, by Ale from Straddle3. Ludobox demo & real-time translation. Sunday was also time for running our Ludobox presentation. Almost nobody on this early morning for the technical part / how-to … « build a box when everybody suffer a collective hangover » ! But we did have few curious with who we talked and shared about the project’s goals and issues of offline process. And we did have time work on a translated version of the Ludobox interface in greek – thanks to Irina – useful for the ongoing demo on Sunday. CommonsFest was also an occasion to meet Ilias Marmara (personalcinema) who actually works on Cargonauts, a video game (serious/art game) which proposes an immersive experience in social life & issues of workers in Pireus harbour. 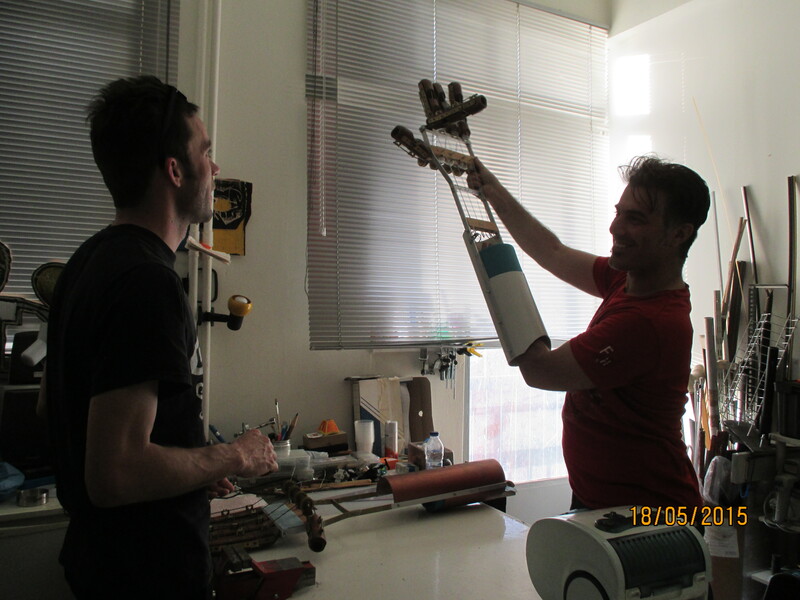 Hopefully, we’ll publish another article based on a interview we did with Ilias and Cargonauts collaborators. At that point, we had collected new projects, had new questions for our own project, but after this activist journey, it was time to talk about the Ludobox with other people : owners of Play Café in Athens. We visited Alaloum Café and Jimmy’s Dungeon Café, both following the same policy : charging customers to book a table, borrow board games and get explanations ; in exchange of what the Café received its commission. Due to this organisation and economy, these rendez-vous led to some absurd situations related to « free content », underlining crucial question about the use of a Ludobox in private spaces : How can I ask for a fee to book a table while explaining rules of a free-licensed game that explicitly claims for non-commercial use ? Could I charge customers for borrowing a free-licensed game? This leading again to absurd point : releasing free-licensed game with commercial restrictions when there are brand new copyrighted tabletop games released every week, and once bought – in your possession – you could do whatever you want (even charge people to play it) … ? If board game industry remains « the » way to reward game designers how to think a conciliation between board game specific ecosystem and free culture ? In conclusion, as a cultural organization that promotes games and game culture, we care about micro-publishing, DIY and crafted creations, short circuits vs made in… – what the game industry would not offer. But we know there is a long road before changing minds (considerations such as : a game that does not appear in a formatted box is not considered as a professional game, same with free-license often associated with amateurism, etc) ? Our point is all about expanding views and see games as commons, social practice and knowledge, and as such, as something that needs to be preserved and shared. If game industry has its restricted marketing pattern, there is for sure a place for repositories of misfits pattern, added rules and iterative stories of gameplay created by citizens and the Ludobox is exactly there to favor, archive and distribute those practices. The long talks at night could not be sum up here, but we surely keep you inform about this future collaboration !